We hope you will come and pray among us! For the curious… the “big three” liturgies of Holy Week are Holy Thursday, Good Friday, and Easter Vigil. These are the “Triduum,” or the three holiest days of the year. If you are able, we invite you to pray all three of these liturgies with us. We begin in the “upper room” as Jesus celebrates the Passover with His Apostles. (This is the most family-friendly of the three liturgies, and has a beautiful Eucharistic procession at the end.) Jesus then goes out to the Garden of Gethsemane, and we go with him, watching and waiting. (The Church is open for prayer all night long.) On Good Friday, as we fast and abstain from meat, the passion and death of the Lord is never far from our minds. At the 3:00pm service marking the death of the Lord on the cross, we mourn for this Lord and Savior who has loved us at the price of His own life. We then wait in silence… the Lord is in the tomb. There is no Mass on Saturday morning. (There is 8:00am Morning Prayer and blessing of Easter food.) After our long silence, we come together in the dark for the Easter Vigil, “watching and waiting” for the Resurrection of the Lord. This service begins outside in the dark, and we enter the inky-black Church led only by the light of the Easter Candle. Throughout the Vigil, the light grows and climaxes at the baptism of our new Catholics and the reception of Holy Communion. 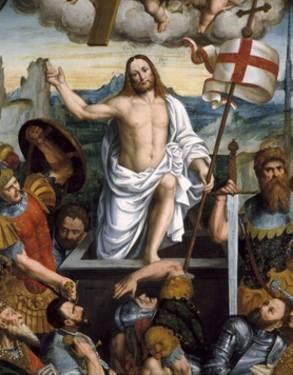 Amen, Alleluia, Christ is Risen!